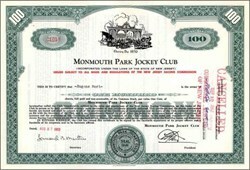 Beautifully engraved certificate from the Monmouth Park Jockey Club issued in 1959-1962. 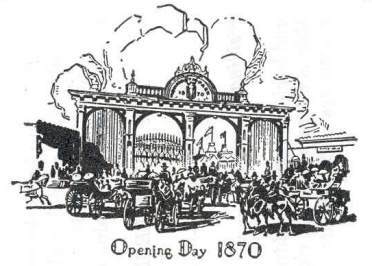 This historic document was printed by the Columbian Banknote Company and has an ornate border around it with a vignette of Monmouth Park Jockey Club Opening Day in 1870. This item has the printed signatures of the Company’s President and Secretary and is over 40 years old. Main Track: The main track is a 100-foot-wide, one-mile oval with 12 inches of aggregate sand drainage and 12 inches of crushed stone screenings topped off by a 4-inch cushion of sand and topsoil. The topsoil is a mixture of silt, clay and loam. Each 1/8 of a mile, or "furlong" originally a "furrow long" or the length of a plowed field, is marked off by a green and white pole located along the inside rail. Each ¼ mile is noted by a red and white pole, while 1/16 mile is designated by a black and white pole. Thus, the "quarter pole" is the red and white pole located on the "far turn," ¼ mile from the finish line. Turf Course: The turf course is a 90-foot-wide, 7/8 mile oval which is a mixture of four kinds of bluegrass and Manhattan 2 rye grass. Paddock and Walking Ring: The paddock is located behind the Clubhouse and consists of a 16-stall oak saddling enclosure leading to the beautiful, tree-shaded English Walking Ring, where the horses are paraded for the public and the jockeys receive last minute instructions. This is one of the most picturesque and relaxing areas at Monmouth Park, and everyone is encouraged to visit and take a close-up look at the courageous equine and human athletes. The Backstretch: The backstretch not only houses approximately 1,600 horses in 38 barns, it also serves as a small community for the horsemen and track's employees. Located in the center of the backstretch in an area known as "The Quadrangle" is the Frenchman's Kitchen, whose motto is "Eat your betting money, but never bet your eating money." The Quadrangle also houses a riding apparel shop, post office, and offices for the racing secretary, racetrack chaplain, horse identifier, state vets and others. A recreation hall features movies, seminars, church services, and games.